It was a "coup de theatre" when Manila's Best Dressed 2012 ladies, all 12 of them, glided down the ramp in all shades of pink. What a feast to the eyes! It certainly brought Makati Shangrila ballroom's cast of hundreds to a deafening round of applause and roars of "Bravo" from relatives and friends. 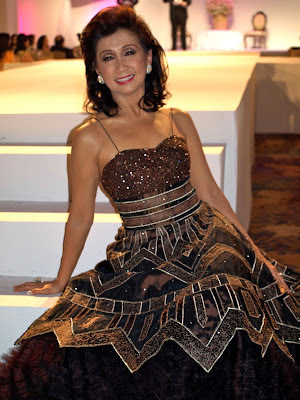 The gorgeous 12 led by Style Icon Ching Cruz were Michaela "Pinky" Puno, wife of former DILG Secretary Ronnie Puno, Bernadette Montinola Aboitiz, Ana Amigo Antonio, Grace Barbers Baja, Elizabeth Siy Co, Kathleen Lior Liechtenstein, Aziza Mondonedo, Sheree Jane Bangayan Chua, Joteen De Jesus - Jimenez, Agile Zamora, and Tootsy Echauz. The Philippine Best Dressed Organization was founded by philanthropists Meldy Cojuangco, Helen Ong, Fortune Ledesma, Johnny Litton, to name a few, to give financial support to cancer victims. They work in conjunction with the Philippine Cancer Society. This year's affair also added Distinguished Men in their program, headed by ex-President Fidel Ramos, Solar President Wilson Tieng, Calata Enterprises founder Joseph Calata to name a few. Host Johnny Litton gave his welcome speech, Helen Ong, who is consistently known for her sense of fashion and elegance followed, thanking everyone present for their support to this heartwarming cause which she has supported for the past 11 years. But the highlight of the affair was the presentation of the 12 Best Dressed ladies who showed their style and elegance for a good cause.